It’s always comforting when the DNA evidence matches the paper trail. Especially when you’ve spent as much time researching a paper trail as The Legal Genealogist has spent on her second great grandmother, Isabella (Gentry) Robertson. Isabella is a challenge for a lot of reasons. Start with the fact that she was married before the 1850 census1 and so was never enumerated in her father’s household. Go on to the fact that she was born well before Mississippi starting keeping birth records,2 likely married in a burned county in Mississippi,3 and died in Texas before death recordation was routine there,4 and you start to see the problems. So any time a cousin DNA tests and matches exactly the way he or she should match if our conclusion about Isabella is right… we breathe a sigh of relief. Which we did this week with cousin Wayne. 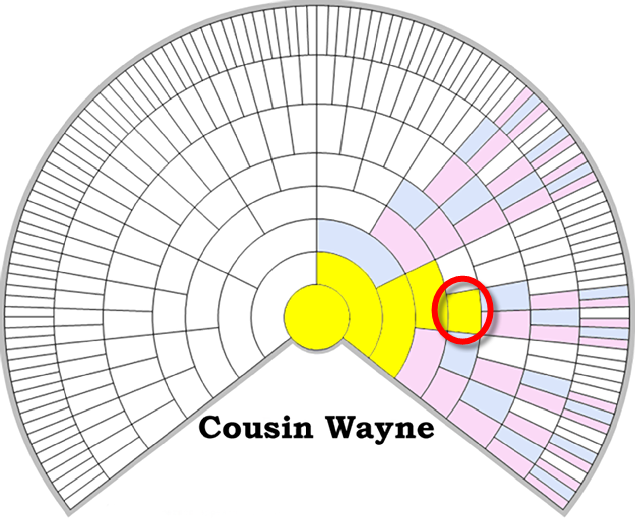 Wayne is my third cousin, descended from Isabella through the third of her 11 children, Bird Alexander Robertson. Wayne’s line goes through his mother, his grandmother, then his great grandfather Bird who was Isabella’s son. Mine and that of my siblings is through our mother, grandmother, and great grandfather Jasper, Isabella’s youngest. So when Wayne’s DNA results showed up on Gedmatch and we were able to do a thorough comparison of the data there, it was truly comforting to see the numbers line up all the way across the board, just the way they should. Using Blaine Bettinger’s Shared cM Project data from August 20177, the expected amount of shared DNA between third cousins is 53 cM, the average 74 cM and the range 0-217. Wayne and I share 57.6 cM. Even better is the fact that we all have a match on the X-DNA chromosome — because that leads directly to Isabella. 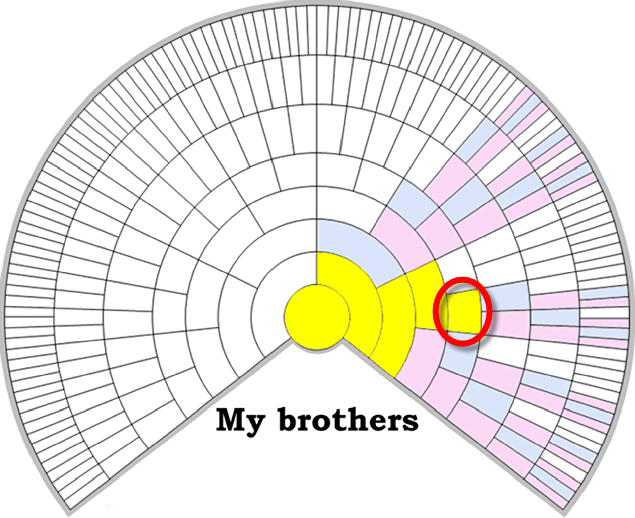 And when you chart out the X-DNA could match, using my brothers (because they have fewer options than I have for ancestors who gave them X-DNA), it’s one of those “ding ding ding we have a winner” moments. Circled in red, on both charts, is Isabella. Nitpick of the day: when you say “married before the 1850 census1 and so was never enumerated in her father’s household”, did you mean ‘enumerated by name’? Of course there could be circumstances that would prevent her showing up as a tick mark in the earlier censuses, too. Being an only child whose only sibling (a brother) died in 1952 at the age of one day, aside from digging him up and maybe (???) finding his DNA, I’ve no hope of a match like yours. On my maternal DNA I come from a moderately long line of women who had only one or two children — another block to matches. My father’s line is 100% Eastern European. Mom’s side — 3 1st cousins who won’t test, and Dad’s side 20+ first cousins (1/2 dozen still living) and lots of known cousins in the old country. I’m open to suggestions. Besides getting your relatives to test and encouraging the spread of DNA testing as a genealogical tool in Europe, no suggestions here. I have a very convoluted family line involving two successive generations of adoptions – my dad and his mother. I had my dad’s adoption records opened when he was 85 so have that piece solved. His mother was different in that she was not adopted but simply given away (I believe). I am certain I have pinpointed my grandmother’s birth to a couple in Minnesota. I have strong DNA connections to both her parents, who lived in the same community as the people who raised her and who I thought were my great grandparents. I compared DNA to a direct descendant of the adopted family and it was negative. To me, the evidence is overwhelming. My problem is this: as a amateur how do I convince anyone else that my findings are valid? What does it take for the evidence to be so conclusive that it has to be accepted without question? Or is it always, “Strong evidence suggests. . .?” What is especially galling is the real parents of my grandmother have a descendant who is a professional, well-known genealogist. He won’t communicate with me. I have a 158 centimorgan (Family Tree) match with his grandmother. There is much more than this but this is the gist of it. Thank you. Ken, there are some people you’re never going to convince no matter what the evidence shows. But to be so conclusive that it must be accepted, DNA evidence needs to both rule in the one set of great grandparents and rule out other options. Not just the folks who raised your grandmother but others who might have been her parents and could explain the shared DNA.